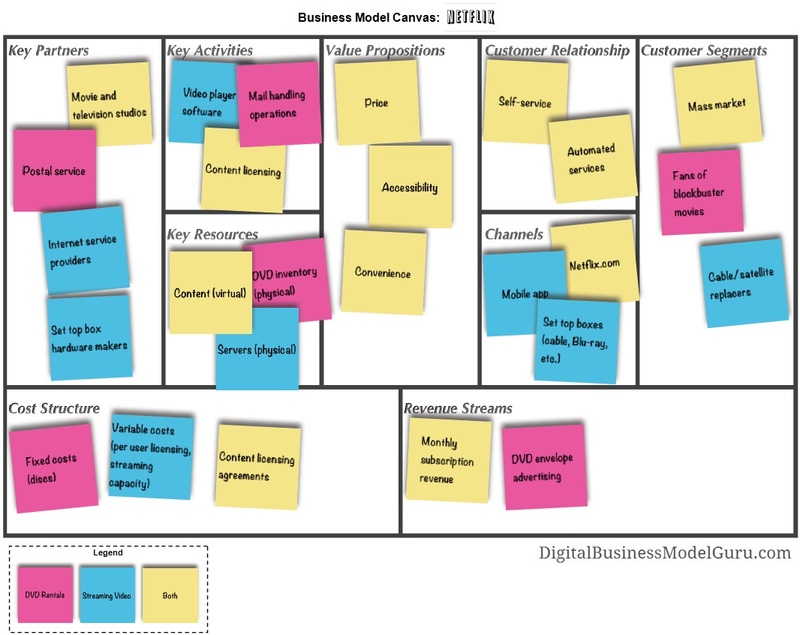 When Alex Osterwalder and Yves Pigneur wrote Business Model Generation in 2009 they couldn't have imagined all the different applications users would come up with for their Business Model Canvas. In this post I'll give you fourteen very different but very practical applications of the Business Model Canvas that we've observed first hand from our global community of practitioners. Over the years we've observed a lot of different types of people who are using the Business Model Canvas in a lot of different types of organizations. We wrote about those learnings in a previous post where we shared our recently published research report. We shared why organizations around the world are adopting the tool and provided some general ideas for ways they are using it. We expand on those useful applications below. We focus primarily on applications we've observed from within large organizations but entrepreneurs and startups will find these ideas equally helpful. Strategic Planning/Development - One of the primary ways we've seen organizations use the BMC is in their regular strategic planning and development cycles. They use it to create a blueprint of their strategy. The BMC provides a very clear foundation and direction for the conversation at hand, whether done in a corporate offsite with the executive team or done around the board room table . Retrospective/Outlook - When used as a strategic plan users apply the BMC to describe what they’ve done the past year and what they intend to do in the year ahead. If there are changes in the business model or entirely new building blocks to be developed then they would indicate that with color coding. An interesting trend here is that the BMC is increasingly used as a modern version of the strategic plan to co-create strategy with people from around the organization to boost alignment and buy-in. Strategic Planning per Business Unit - In larger organizations we’ve also seen the canvas being used for strategic planning per business unit, because it gives you an overview of what the different business units are doing. The BMC works as a shared language across business units and provides you with a snapshot of your organization's business model portfolio (cf usage 4). Dashboard - We’ve seen a couple of teams and companies start using the BMC as a dashboard. They define a set of indicators for each building block of their Business Model Canvas that they want to follow. Then they define a performance threshold for each indicator. It's on green if they are happy with the performance per indicator, turns orange if there is something to look at, and turns red if there’s a problem. For us it was interesting to see how some users hacked the canvas to "repurpose" it in a very very innovative way in order to follow the performance of their organization. Understanding Competition - Another interesting way to use the BMC is to understand competition. By sketching out the business model of each one of your competitors you gain a better understanding of their strengths, limits, constraints, and what they can or can't do. This increased understanding of your competitive landscape will allow you to act accordingly and design a better business model. Portfolio of Business Models - A particularly interesting area for application of the BMC is the idea of developing a portfolio of business models, ranging from improving existing business models all the way to inventing new business models. While product and brand portfolios are relatively well mastered in large organizations, business model portfolios are an entirely new phenomenon. A business model portfolio helps you understand and highlight with which business model you are making cash today and with which business models you’re going to make cash in the future. Beyond growth and cash generation the portfolio approach also helps you understand synergies and potential cannibalization between the different business models. Increasingly, organizations are moving away from just managing product portfolios and brand portfolios towards business model portfolios. This is still a very young field of development, but it’s a very very promising one. A good illustration of this business model portfolio approach is Nestlé's use of it's machine and pod technology. It all started with Nespresso's innovative business model built around single portioned coffee. Today the same technology is used in its mass market coffee (Dulce Gusto by Nescafé), it's tea business (SpecialT), and even for its baby formula (BabyNes). While they all use the same underlying technology all of these businesses have different business models with potential synergies and cannibalization. Design, test, and build new growth engines - This application is very closely related to the original intent of the BMC outlined in Business Model Generation and refined in Value Proposition Design. Here the BMC is used to prototype alternative business models and test them with the Lean Startup / Customer Development Process. We call this the search for the right business model and value proposition. New idea template - A lot of organizations use the BMC as a (sometimes mandatory) template to develop and/or submit new ideas. The interesting thing here is that then the ideas become comparable. This unifying lense or language allows you to compare all types of innovations ranging from process innovation and product innovation all the way to substantial business model innovation and the creation of new growth engines. Corporate incubators and accelerators in particular are huge fans of the BMC to manage the ideas of their different teams. Understanding customers - An incredibly interesting and innovative use of the BMC is that of companies that use the Canvas to sketch out the business models of their customers. By better understanding their customer’s business model they can develop better value propositions and/or better explain their solutions in the context of their customer's business. For example, Ericsson, the telecom equipment manufacturer, uses a version of the BMC to better understand the network operators they are serving. Or, SAP, the German software giant, uses the BMC in their pre-sales process. Sales teams map out the customer's business model in collaboration with the customer or as a preparation for sales meetings. Alignment/CxO/executive on boarding - While we always saw the BMC as an alignment tool, it was a surprise to us that leadership teams would use the BMC as an onboarding tool for CEOs or senior executives. The first time we discovered this type of application it was more of an accident. We were running a business model workshop in a company that just hired a new CEO. He loved the approach because it gave him an immediate understanding of the entire organization in one workshop. Another organization in Asia started using the BMC systematically for every senior executive on boarding. They get every new hire to sketch out the company's business model. In another case a CFO used the BMC to understand the business model he was getting into when he was starting a new job. He then got the entire leadership team to run an alignment workshop with the Business Model Canvas. Strategy diffusion and co-creation - A very powerful way to use the BMC is in the context of strategic alignment across the organization. On the one hand it can be used for strategy diffusion or on the other hand - as I mentioned previously (cf usage 1) - for strategy co-creation to create buy-in. The canvas plays a very powerful role in strategy diffusion because it becomes the blueprint of your strategy that shows more concretely, more clearly how you’re going to implement your strategy. Shared language across functions - One of the biggest areas of application where we’ve seen the canvas succeed phenomenally is as a shared language across the organization. The Canvas is particularly helpful when applied across functions. People from marketing, technology, engineering, operations, finance, and so on can all work together around a BMC and have a shared language to discuss their ideas. Whether it's new ideas on the table, new businesses on the table, or new business models that are going to be developed, the Canvas becomes the central, unifying tool to center the conversation. The Canvas doesn't just provide a shared language to make conversations better, it also makes conversations more strategic, and in particular, it provides an outcome that can actually be implemented. General alignment - The BMC helps generally with alignment because on one piece of paper we have all the essentials of the blueprint of your strategy. In a previous post we shared The Business Model Theatre video and how the Canvas is made up of a front stage and a back stage. On the front stage, the Canvas very clearly delineates how you’re creating value for customers and how that allows you to generate revenues. On the backstage the Canvas describes what resources, activities, and partners you need to create this value and how that generates costs. The BMC makes it possible for everybody to have a shared understanding of what we’re trying to achieve as an organization. It makes explicit what the pieces of your business model are, what the blueprint of your strategy is, and guides everybody to work towards that end. Investment decisions - Some organizations are using the BMC to make better investment decisions. Once you've sketched out a business model(s) and you understand the underlying business opportunity, you have a better understanding of where you should allocate resources. This is true both for improving existing business models to inventing entirely new business models. Of course we recognize that it’s actually easier to generate quick revenues from existing business models and harder to generate long-term revenues from new ones, but we need to allocate resources across the entire portfolio of business models. The Canvas makes business opportunities explicit and can serve as a guide to how those resources get allocated. Mergers and acquisitions - One application that we really didn’t expect would come up is the application of using the BMC in context of mergers and acquisitions. The idea here is that you would sketch out the business models of two organizations and figure out if there is a good fit. If you do this for a couple of organizations within a specific industry you'll better understand where there are potential synergies and opportunities for integration and where more differentiating factors will cause you to run into challenges. This application can be used for large and small mergers and acquisitions as well as in settings where an organization has an internal startup and wants to acquire or merge it back into the parent company or back into an existing business unit. Exit strategies (IPO, acquisition) - The last application we'll provide here is using the Canvas in the context of exit strategies. When assessing the opportunity of bringing an organization to the market you can use the Canvas to determine where you are going to allocate the money, how you will create better value propositions, how you will acquire more customers, or how to decrease your costs and increase your revenues. If you aren't going for an IPO and you want to sell the company and get acquired you will want to understand if and how your organization fits with other organizations. In this case you would apply the Canvas in the same way as we’ve seen with Mergers & Acquisitions (cf usage 13). It has been incredibly exciting to see so many very different applications of the Business Model Canvas. Here we've provided 14 ways to apply the Canvas and I’m sure there are many more. Hopefully this gives you a little bit of a taste and some appetite to figure out how you could apply the Business Model Canvas within your organization. 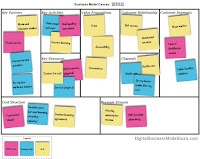 What new or interesting ways have you found to apply the Business Model Canvas? How will you apply it in your organization?